Mike Rosenbaum is an award-winning sports writer covering various sports and events for more than 15 years. The rules for the three Olympic individual sprint events (100, 200 and 400 meters) have only slight differences. The relay races (4 x 100 and 4 x 400 meters) have additional rules regarding baton passing. The rules for each event are the same for both men and women. The relay baton is a smooth, hollow, one-piece tube made of wood, metal or another rigid material. It measures between 28 and 30 centimeters long and between 12 and 13 centimeters in circumference. The baton must weigh at least 50 grams. All Olympic sprint and relay events include eight runners, or eight teams, in the final. Depending on the number of entries, individual sprint events include two or three preliminary rounds before the final. In 2004, the 100- and 200-meter events included one round of preliminary heats followed by quarterfinal and semifinal rounds prior to the final. The 400-meter sprint included one round of preliminary heats plus a semifinal round. Sixteen teams qualify for the Olympic 4 x 100 and 4 x 400 relays. Eight teams are eliminated in the opening round heats while the other eight advance to the final. Runners in the individual sprints, plus the leadoff relay runners, begin in the starting blocks, which are marked on the track. The other relay runners begin on their feet when they receive the baton in the passing zone. 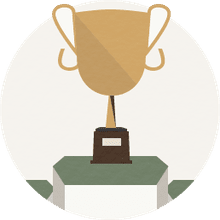 In all sprint events, the starter will announce, “On your marks,” and then, “Set.” At the “set” command, runners must have both hands and at least one knee touching the ground and both feet in the starting blocks. Their hands must be behind the starting line. The race begins with the opening gun. Runners are permitted only one false start and are disqualified after a second false start. The 100-meter race is run on a straightaway and all runners must remain in their lanes. As in all races, the event ends when a runner’s torso (not the head, arms, or legs) crosses the finish line. In the 200- and 400-meter runs, plus the 4 x 100 relay, competitors must again remain in their lanes, but the starting line is staggered to account for the curvature of the track. In the 4 x 400 relay, only the first runner remains in the same lane for the full lap. After receiving the baton, the second runner may leave his/her lane after the first turn. The third and fourth runners are assigned lanes based on the position of the team’s previous runner when he or she is halfway around the track. The baton can only be passed within the exchange zone, which is 20 meters long. 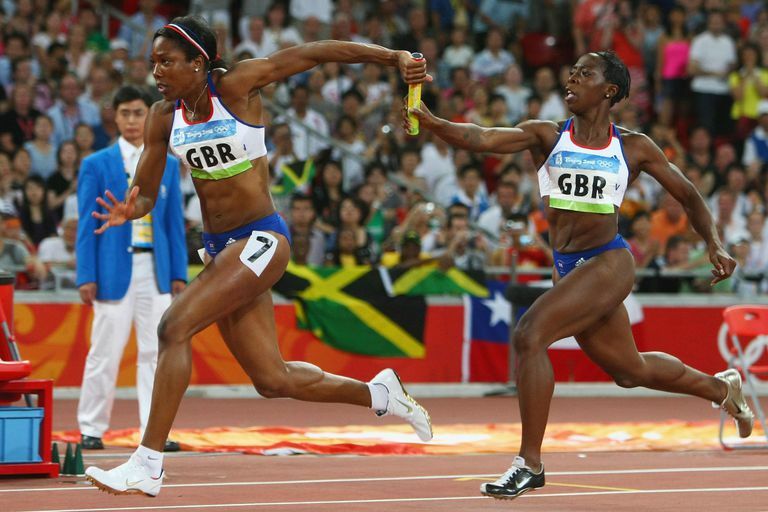 Exchanges made outside the zone—based on the position of the baton, not the runners’ feet—result in disqualification. Passers must remain in their lanes after the pass to avoid blocking other runners. The baton must be carried by hand. If it is dropped, the runner can leave the lane to retrieve the baton as long as the recovery doesn’t lessen his or her total running distance. Runners may not wear gloves or place substances on their hands to obtain a better grip on the baton. Any athlete entered in the Olympics may compete on a country’s relay team. However, once a relay team begins competition, only two additional athletes may be used as substitutes in later heats or the final. For practical purposes, then, a relay team includes a maximum of six runners—the four who run in the first heat and a maximum of two substitutes. Advice for coaches and for 4 x 200-meter relay runners.